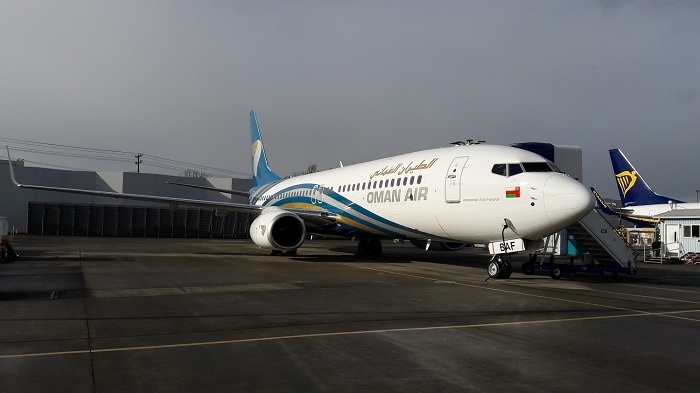 A new Boeing B737-800 has joined its fleet of Oman Air. This new aircraft will be used on short and medium haul routes and has a capacity of 162 seats, with 12 Business class seats of seat pitch 46 inches and 150 Economy class seats with seat pitch 30 inches. Oman Air has operated B737s for many years and the aircraft provide the backbone of the airline’s long and medium haul fleet, with 32 currently in operation. The new aircraft will be deployed soon on its arrival for commercial flights. Abdulaziz Alraisi, executive vice president products and brand development, said: “Oman Air is adding new aircraft to its fast growing fleet to keep up with the expansion programme. The aircraft’s inaugural flight departed Seattle on March 13th and arrived to Muscat on March 15th. With the addition of the new Boeing 737 – 800, Oman Air’s fleet stands at 51. Oman Air is continuing with its ambitious expansion plans in 2017 with four new additions to the fleet already this year. The latest were the Boeing 787 Dreamliner which joined the fleet on 23 February 2017, beside the two new 737-800s added to the fleet in January and February. In addition, a new Dreamliner B787-9 will be joining Oman Air’s fleet in the coming April.